OVER THE BLOCK – Seth Carey (13) of the Porter Creek Rams attacks the ball from the left side in the second set in Thursday’s Supervolley semifinals. Carey won player of the game honours, leading his team’s offence in a 3-0 win. The Supervolley semifinal matches were played Thursday night. The Supervolley semifinal matches were played Thursday night. In the first game of the night the F.H. Collins Warriors took on the Vanier Crusaders, to decide who would play the Porter Creek Rams in the finals. The Warriors took the match 3-1. Energized by their home crowd the Crusaders came out flying in the first. They were able to play solid defence, and serve and attack well, finding the holes in the Warriors defence. Their strong play led them to a 25-18 first set win. In the second set the teams traded early points, unable to get into any sort of rhythm. It was the Warriors who made the first run of the set fuelled by some big swings from attacker Maya Carins-Locke, growing the lead to 11-6. The Warriors continued their strong play. Able to pass the ball to their setter they were able to establish the middle, which according to head coach Gary Seeley was the game plan from the get go. Warriors soon found their game as both teams were swinging hard and aggressive, but it was no match for the blocking, as each team had some monstrous denials. The Warriors managed to pull ahead in large part to a strong serving game. The Warriors won the third set 25-19 after Dylan Massie found the back corner on her attack. In the fourth set the Warriors came out swinging led by Boyd. They jumped on the Crusaders early and did not let up taking the fourth set 25-12. With the win the Warriors will turn their attention to the finals played tonight at Vanier. Seeley believes his team is ready for the Rams. The Porter Creek Rams took on the Warriors in the boys Supervolley semifinal. The Rams took the game in straight sets and will play the Vanier Crusaders in the final. In the first set both teams looked tentative. The Rams got out to an early 9-6 lead, as they were able to generate their offence. That lead quickly grew to a 22-11 advantage, a deficit the Warriors could not overcome. The Rams took the first set 25-14. In the second, the Rams offence came alive, led by player of the game, Seth Carey. Carey was able to score on a number of shots, and then went on a big serving run to give his team a 16-12 advantage. The Warriors had a late push at the end of the set, but the Rams lead was too much. Carey got the set winning kill, for a 25-18 set win. Assistant coach Mike Kelly said his team played Rams volleyball throughout the match, and he was happy with the effort. In the third set the Rams got out to an early 6-2 lead, led by Carey who was swinging strong all game. The Rams were also getting plenty of offence from middle Jesse Goodman and right side Grayson Turner, who both had some booming attacks. The Rams had a 15-10 lead midway through the set but the Warriors clawed back to make it close, though were never able to overtake the Rams lead. The Rams took the third and deciding set 25-17. 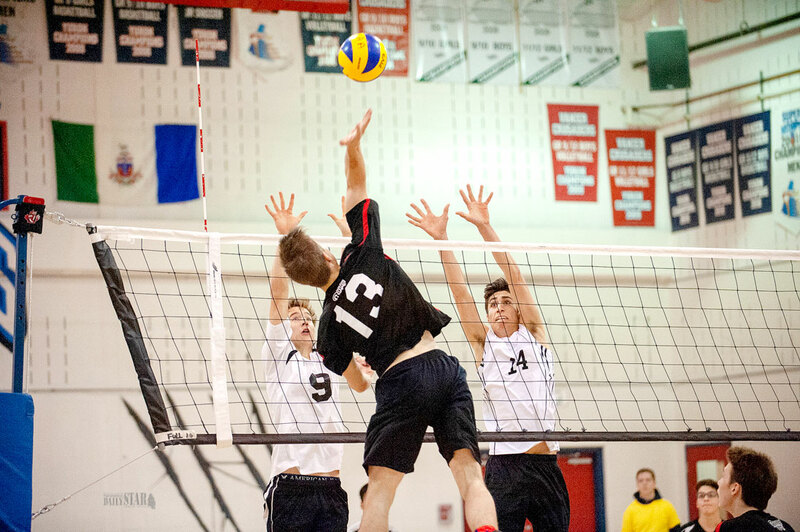 The Rams will play the undefeated Vanier Crusaders tonight in the Supervolley final.